We have information you must know before you buy the Avalon. The redesigned 2019 Avalon is here with a sportier look and a larger, lower body. It promises better handling and the latest connectivity with Apple CarPlay. Unfortunately, the new Avalon's base price is $2,000 higher than it was before. The good news is the Avalon Hybrid's MSRP is now closer to that of the gas version and may be a smart upgrade. The 2020 Toyota Avalon is set to kick off production in July 2019 in preparation for a September 2019 arrival. 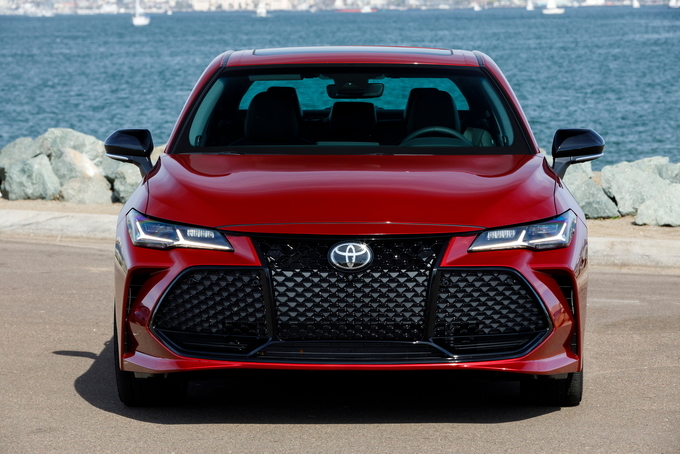 The 2020 Avalon will include a TRD model that will feature sportier looks and reduced weight. Sadly, there are no big performance upgrades other than a handful of chassis tweaks. Toyota's offers are regional and set to expire on April 30, 2019. Unless otherwise noted, all deals mentioned here are for Southern California. Toyota may release a few new offers on the Avalon around Memorial Day, so stay tuned for updates. The 2019 Avalon XLE is available on a 36-month lease that runs $439 per month with $1,999 due at signing. With an effective monthly cost of $495, this offer is a bad value relative to its MSRP. The Avalon Hybrid XLE's 36-month lease also runs $439 per month with $1,999 due at signing. This puts its effective monthly cost at $495, which is still a bad value but a no-cost upgrade from the gas model. In April, Toyota continues to offer the 2019 Avalon with a $2,000 rebate to help improve prices. Current Camry and Camry Hybrid owners get an even sweeter deal. They can upgrade to the Avalon or Avalon Hybrid and get an extra $2,000 loyalty rebate in exchange. Buyers cannot combine these rebates with the Avalon's low APR deals. Qualified buyers can finance the 2019 Toyota Avalon from 1.9 percent APR for up to 60 months. There is also a 72-month offer that runs 2.9 percent. 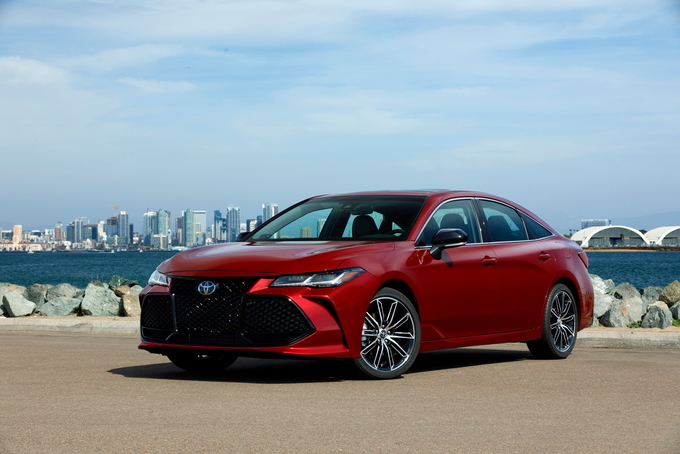 The all-new 2019 Toyota Avalon debuts when the demand for cars has been waning and customers continue to turn to crossovers. If anything, this monumental market shift only seems to have encouraged Toyota to push its own traditional boundaries for its flagship sedan. The Toyota Avalon is all new for 2019. The Avalon is available in four trim levels, XLE, XSE, Limited, Touring. For those looking for maximum efficiency, the all-new Avalon Hybrid is available as well. Toyota’s newest global platform, which also underpins the Camry, allows the engineers better control over the ride and handling while the stylists also took bold measures with sharp edges and complex surfaces. The XSE and Touring trims have a sporty attitude, while the XLE and Limited trims focus more on comfort. 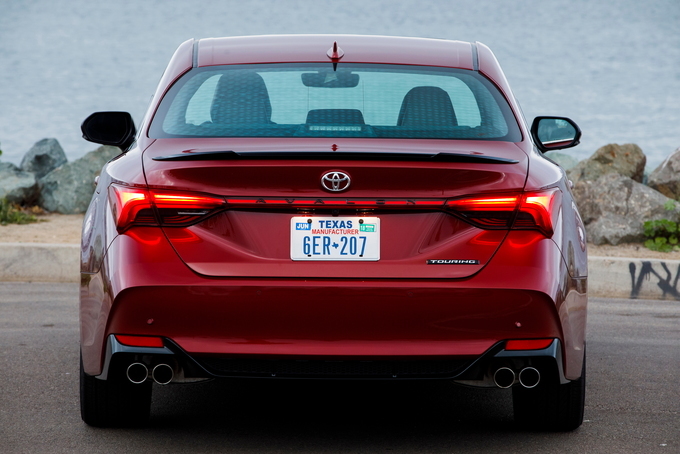 The gas-powered Avalon is offered with a 3.5-liter V6 delivering 301 horsepower and 267 foot-pound of torque. The front wheels are driven via an eight-speed automatic transmission. The base XLE achieves an EPA-estimated 22 miles per gallon city, 32 mpg highway, and 26 combined. On higher trims with larger wheels and added features, the highway and combined mpg figures are reduced by one. Toyota claims improved aerodynamics over the previous model. The base XLE trim starts at $36,420 (all prices include the $920 destination charge) and features 17-inch wheels, LED front and rear lighting, and the Toyota Safety Sense P suite of active safety features, which includes forward collision warning, adaptive cruise control, lane keeping assist, blind-spot monitoring, and rear cross-traffic alert. Furthermore, automatic high beams and a three-year subscription to Safety Connect, featuring automatic collision notification, are also standard safety tech. The interior includes heated eight-way power front seats, a seven-inch screen in the gauge cluster, automatic dual-zone climate control, and proximity entry with push button start. 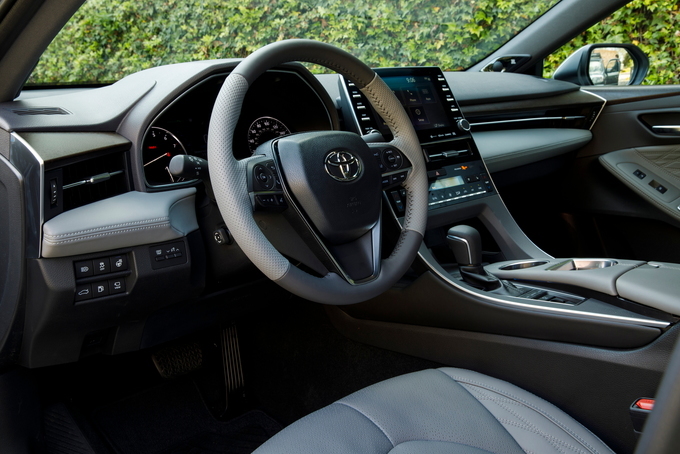 Toyota’s latest Entune 3.0 connected services is operated through a nine-inch touchscreen display with satellite and HD radio, Apple CarPlay, and a six-month trial of WiFi through Verizon. Remote connectivity works with certain Android and Apple devices to remotely unlock and lock the doors and start the engine, while Amazon Alexa compatibility enables car-home device communication. There are three option packages offered. The JBL Audio Upgrade ($680) adds a 14-speaker audio system that features Toyota’s first application of its 7.1-channel audio experience, while Clari-Fi software rebuilds lost fidelity. The Moonroof Package ($1,000) includes a power tilt and sliding moonroof and wireless charging. The Moonroof Package with options ($1,680) combines the features of both equipment groups. Starting at $38,920, the XSE is visually differentiated from the XLE by its 19-inch black wheels, standard moonroof, darkened inner-headlights, quad-tipped exhaust, and gloss-black painted door mirrors, grille, and rear spoiler. Suede seat inserts, real aluminum trim, and a premium leather-covered steering wheel with paddle shifters that feature rev-matching downshifts bring the dynamic spirit to the interior, while the sport-tuned suspension sharpens the ride. The $680 JBL Audio Upgrade package returns, and mechanical bits and software programming enhance the intake and exhaust sounds with it ordered. Positioned above the XLE, the Limited is priced from $42,720 and rides on unique 18-inch wheels, features the JBL Audio system, and includes premium leather surfaces. The exterior of the Avalon Limited gains a detailed front headlight design and front and rear turn signals that light sequentially. A 10-inch color head-up display, ambient lighting, genuine wood trim, ventilated front seats, heated rear seats, and a heating steering wheel are among the additional luxury features included as standard. The Advanced Safety Package ($1,150) adds a surround-view camera with perimeter scan, an intelligent clearance sonar system with rear cross-traffic detection and automatic braking. The Touring trim starts at $43,120 and takes the sporty nature of the XSE and includes an adaptive variable suspension and two additional dynamic chassis settings. There are 650 individual steps where the dampers can change their stiffness, promising improved handling dynamics while still offering the comfortable ride expected of an Avalon. The seating gains the same heating and cooling features of the Limited, but feature the grippier suede inserts. The headlights also blend the advanced lighting systems with the dark inner housing of the XSE. The Advanced Safety Package is again available for $1,150. 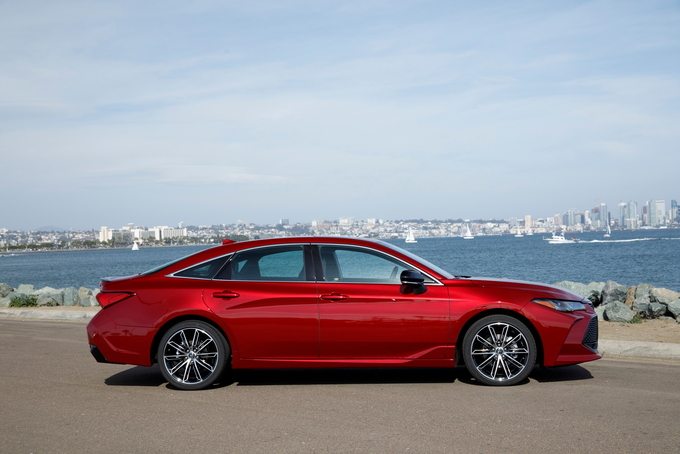 The 2019 Toyota Avalon presents a solid value out of the gate with its new platform, design elements, and attention to detail. The XLE with the JBL Audio Upgrade package will make the most of the quiet and comfort-focused ride while the largest rear space in the class will be sure to impress. The good gets better. 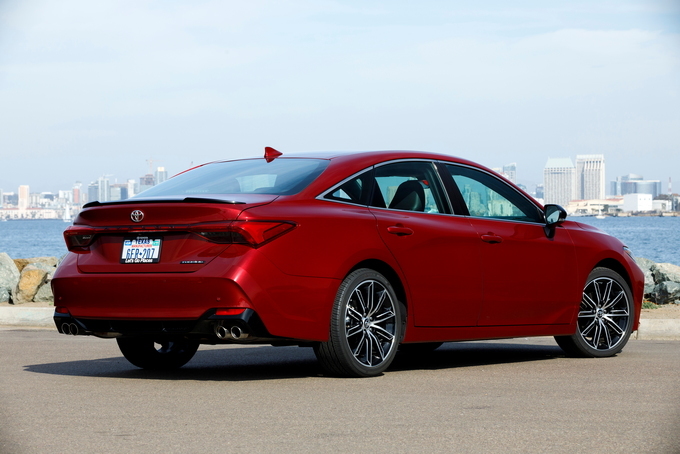 All-new for 2019, the fifth-generation Toyota Avalon, riding on the brand's new Toyota New Global Architecture (TNGA) platform, is longer, lower, wider, and more powerful than the outgoing model. The rear cabin was extended back 7 inches, while body height, cowl height, and rear deck height are lower by 1.0, 1.2, and 0.8 inches, respectively. In addition, new stamping methods allow for more sculpted body panels. Handsome styling. The 2019 Avalon receives fresh sheetmetal all-around. Along its flanks, the elegant look is punctuated by prominent upper and lower character lines, and sharp creases around the wheel wells. In back, a narrow light bar connects the progressive taillights, while touring models feature a narrow deck lid spoiler and an aggressive lower fascia bracketed by two pair of chrome-tipped exhaust finishers. The interior is equally inspiring and library-quiet over rough and uneven pavement as well as at freeway speeds. Contrasting colors highlight a mix of upscale materials, while all lines lead to the Android Auto and Apple CarPlay-compatible 9-inch, pedestal-mounted, infotainment touchscreen that dominates the middle of the dash. The only misstep is the mesh grille on XSE and Touring models. Overpowering the delicate narrow LED headlight enclosures, it's also too wide and too low for our tastes. Wide ranging safety. Standard advanced active safety features on every Avalon include forward collision warning, automatic emergency braking, lane departure warning, lane keeping assist, blind-spot monitoring, adaptive cruise control, a rearview camera, rear cross-traffic alert, and automatic headlights with high-beam assist – many of which are either optional or available only on certain trim levels of rivals like the Nissan Maxima, Kia Cadenza, Chevrolet Impala, Buick LaCrosse, and Chrysler 300. Engine and suspension tweaks. Under the hood, the 3.5-liter V6 engine gets a boost in horsepower from 268 to 301 for even stronger acceleration and more confidant highway passing. Touring models are equipped with Toyota's first adaptive variable suspension that adjusts the damping and shock stiffness for a predictably smooth Normal mode and dramatically heavier steering, quicker throttle response, more rapid gear changes in higher revs, and a stiffer ride in Sport+ mode – challenging the sportier offerings from Nissan and Chrysler. Despite the stab at performance, the Avalon works best as a sedate highway cruiser. The piped-in noises don't satisfy like a true V8, while the sport-tuned exhaust hollers but doesn't scream. It also lacks the all-wheel-drive capability of the Subaru Legacy and certain Chrysler 300 models. Good fuel economy. Fuel economy is above average for the class, showing an EPA-estimated 22 miles per gallon city, 31 mpg highway, and 25 combined in base configuration. These figures drop to 22/31/25 mpg (city/highway/combined) on all but the base XLE trim. Final thoughts. 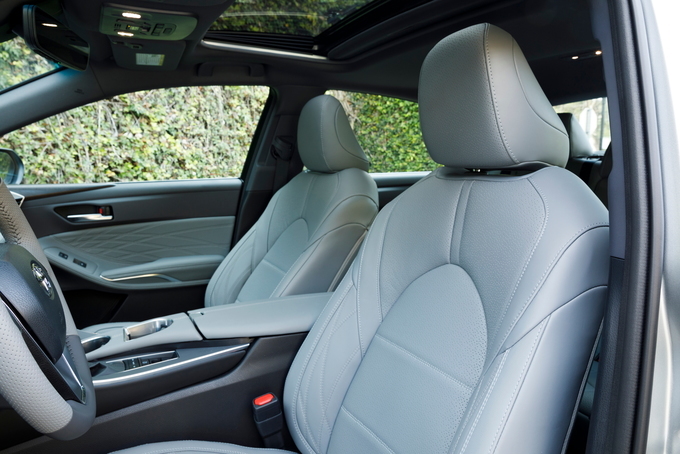 The 2019 Toyota Avalon manages to retain what we liked about the previous model – a supple ride and spacious interior – while upping the ante with more horsepower, slicker styling, and more rear seat room. At the same time, the overwrought grill on some models spoils the overall design, while some of the sportier features appear forced on what's otherwise a sedate highway cruiser. In terms of the competition, the Chevrolet Impala, Chrysler 300, and Kia Cadenza offer more interior space, both the 300 and Nissan Maxima offer better-handling trims, while the Chrysler can be had with a muscular 5.7-liter V8 engine. We have partnered with trusted dealers in your area to give you a great price on the new Toyota Avalon.